I recently was told that it was now officially Autumn. Really??!! Summer couldn’t have passed by that quickly, could it have? The temperature yesterday was still the 90’s as it has been for much of the past few weeks, and the humidity is ridiculous by Southern California standards. But it’s true, Fall is here. There were signs: Football season has started. Heck, HOCKEY season has started. And most of all, from a classical music standpoint, the Hollywood Bowl season ended just as the Los Angeles Opera season started, followed quickly by the Los Angeles Chamber Orchestra kicking things off in Glendale and the Westside, and, last but not least, the Los Angeles Philharmonic returning to Walt Disney Concert Hall. Time flies when you’re having fun, and before we continue talking about the Fall seasons that have recently begun, let’s take a quick look back at the summer. I’ll admit, I wasn’t that excited about the way the LA Phil’s 2015 Bowl season looked on paper, but in hindsight, the concerts I attended were as consistently enjoyable as any in recent memory. The Hornucopia. The Hornapalooza. The Hollywood Bowl at its Horniest. Whatever you want to call it, it was truly awesome. 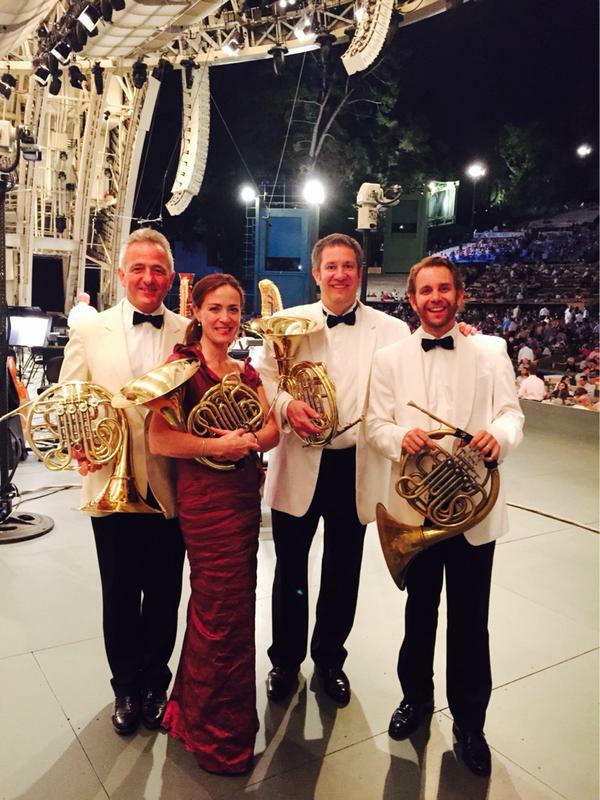 The first of the two LA Phil concerts done in conjunction with the 2015 International Horn Symposium was one of those singular musical moments for which the Bowl is known. My guest that night, an experienced musician who has served as Principal Horn for various orchestras, said it was the best horn playing she’d heard in her life. And you didn’t have to be a horn expert or even a horn aficionado to come to a similar conclusion. It was a top-notch experience on all fronts: the mood was festive, the crowd was enthusiastic, and the music-making phenomenal. Start with the world premiere of Bruce Broughton‘s Fanfare for Horns, a work written for a quartet of horn quartets (that’s 16 total instruments, for those among you who are unfortunately math challenged). It featured the horn sections of the Los Angeles Philharmonic (with legendary Hollywood studio hornist James Thatcher playing guest first chair) and San Francisco Symphony, joined by the American Horn Quartet, Stefan de Leval Jezierski and Andrej Žust (both of the Berlin Philharmonic), Peter Luff (Queensland Symphony), and Jeff Nelsen (Indiana University, Jacobs School of Music). Mr. Broughton managed to craft a work that was appealing in both style and substance. He showed off the breadth of the horn’s timbral capability via the typical techniques and mutes used by modern players while eschewing more avant-garde methods. At the same time, he kept the sonic landscape translucent enough to allow individual quartets to be heard distinctly. The centerpiece of the evening was Schumann’s Konzertstück for orchestra and four solo horns. You’re unlikely to see it on any program, and you’re probably never going to see the solos played by such prominent hornists at the top of their collective game: Stefan Dohr, Berlin Philharmonic Principal Horn, played the 1st part; Andrew Bain, LA Phil Principal Horn, played 2nd; Timothy Jones, the London Symphony’s Principal Horn, was 3rd horn; and Sarah Willis, Berlin Philharmonic 4th horn, in final solo spot. Their playing was radiant, full of joy and gusto one moment, and warm and tender the next. They were clearly having fun and it showed in their sound and their demeanor. As an encore, they offered a four-horn arrangement of Consuelo Velasquez’s “Besame Mucho” to the delight of all. Mr. Bain returned to his usual place in the first chair of the LA Phil’s horn section after intermission where he was featured in two orchestral works by Richard Strauss, the Rosenkavalier Suite and Till Eulenspiegel’s Merry Pranks. His playing was as captivating and nuanced as ever, especially on Till Eulenspiegel. The orchestra, conducted by James Gaffigan and augmented in the Straus works by the horn quartet of the Berlin Philharmonic, was in excellent form. Mind you, Strauss is one of my least favorite composers and this concert still tops my list for the summer. If you didn’t go, you blew it. The soloist was solid if unheralded. The program — an exclusive party for strings & percussion sections only, featuring Bernstein’s Serenade and music from Bizet’s opera, Carmen, in Rodion Shchedrin’s orchestral arrangement — was not off-putting but not particularly compelling either. Yet the concert was engaging simply because Ms. Gražinytė-Tyla made it so. She conducts with attentiveness and snap, keeping a clear beat without ever devolving into a walking metronome, and using her eyes and face as much as her hands and arms to communicate her thoughts to the orchestra. Whatever she does, it works. The orchestra responds well, sounding as good for her as they do for much more heralded conductors. Moreover, her interpretations are full of interesting choices in the details while keeping in mind the big picture and the long line. Even her Star-Spangled Banner has improved much since last summer. On top of all of the technical skills, she has charisma. Her podium demeanor is brimming with confidence without ever seeming cocky. She has an infectious smile and attractive face that is tough to ignore on the Hollywood Bowl’s HD big screens. She even knows how to be a bit of ham: during the famous Toreador song, she motioned to the audience to sing along to the music; it wasn’t her fault that most of them didn’t see her because they were looking at the big screens which were focused on instrumentalists instead of the podium. 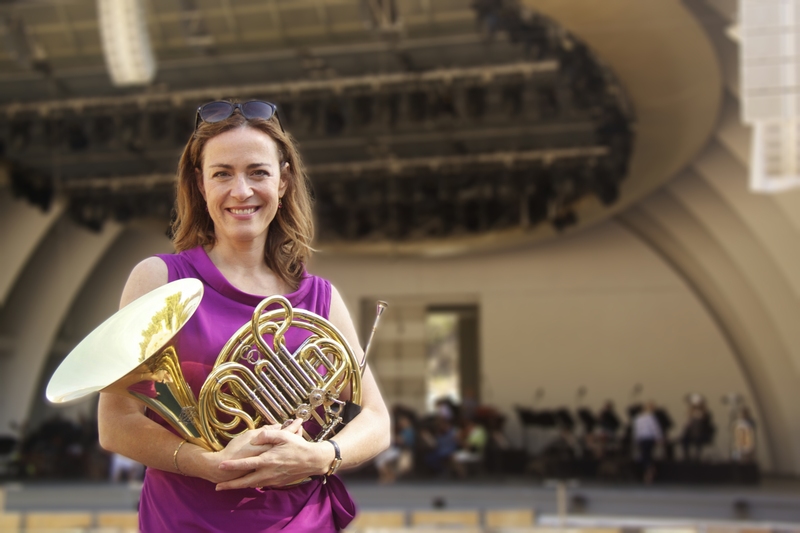 Last summer, the LA Phil promoted her from Conducting Fellow to Assistant Conductor. This summer, they promoted her to Associate Conductor, which should keep her around these parts for at least another year, maybe two if we’re lucky; however, her upward trajectory will likely continue, and credible sources say that she’s gaining interest from orchestras all over the globe. Southern California classical music fans should catch her while they can still do it conveniently. The Violin Concerto of Felix Mendelssohn is truly great music, but it is overplayed to the point where I often take pains to avoid it. But it never sounds tired in the hands of Gil Shaham. Flashback to 1993 at the Dorothy Chandler Pavilion. . . . The first time I saw him play the ubiquitous concerto, it wasn’t even a real concert but rather an open rehearsal with the Los Angeles Philharmonic, back when the orchestra still did such things. Esa-Pekka Salonen and crew were coming off a break after working in great detail on Ives’ Thanksgiving Day and excerpts from Prokofiev’s Romeo and Juliette. Mr. Shaham, then still a precocious 22-year old, walked somewhat sheepishly on stage to join them. 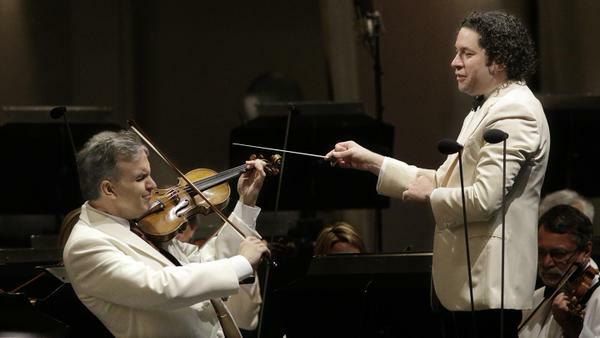 He and the LA Phil waited for the their cue from the podium, and off they went, playing the work through from start to finish without being stopped by Mr. Salonen. When it was done, someone from the orchestra shouted a loud “Bravo!” and the rest of the players clapped their hands,shuffled their feet, and cheered in loud approval. Those of us in the audience ignored the warning we had been given by the house staff not to interrupt the work on stage with applause, and gave a standing ovation. Mr. Salonen had the orchestra and soloist take a bow, and then he let everyone go for the day — nothing more needed to be fixed or tweaked. Mr. Shaham made the melodies soar and the sizable technical hurdles seem nonexistent. He downplayed the work’s contemplative moments and preferred a no-nonsense take that still had its share of interpretive subtleties. It was as charming as it was damn impressive. Some folks may have preferred more lushness, but not me. It had such a strong impact on me that I still recall it as if it were last month instead of last century. Fast-forward to this summer: over 20 years later, much of his approach remains the same — after all, if it ain’t broke, why fix it? Yet as one would expect, there is even more depth to his interpretation now. In this performance, he was willing to embrace the concerto’s heart-on-the sleeve romanticism without needing to wallow in it. The virtuosity is still there in spades, but there is an even more organic sense to his phrasing. And he remains as adorable as ever. The orchestra gave him excellent support, and as they did two decades ago, cheered for him with the same enthusiasm as the audience did. Mr. Dudamel gives good Mendelssohn. He has consistently shown a great feel for the composer’s music, and it was evident again on this night’s second half with an energetic and nuanced interpretation of the incidental music for A Midsummer Night’s Dream. A women’s choir, two vocal soloists, a featured narrator, and video projections put the score into the appropriate theatrical context. The LA Phil, women of the LA Master Chorale, and vocal soloists Deanna Breiwick (soprano) and Jennifer Holloway (mezzo-soprano) were uniformly excellent. The woodwind principals (flutist Cathy Karoly, oboist Ariana Ghez, clarinetist Burt Hara, and bassoonist Whitney Crockett) sounded particularly wonderful. Bryce Dallas Howard was in the difficult position of having to recite Shakespeare’s lines out of context while playing multiple characters; she seemed a little stiff at first, but seemed to settle down part-way through, doing a credible job in the end. Much less favorable were the imagery and video directed by Alberto Arvelo which were projected onto the Bowl’s shell and HD screen; they were superfluous at best, often distracting, and sometimes outright annoying. First of all, let me say that this was not just my favorite concert that featured the Bowl’s massive HD screen, it also was my second overall favorite concert of the entire summer. The concert was mainly played for laughs, that much is true, as is the fact that the big stars for the evening were with the world’s most famous wascally wabbit and his cartoon friends; but that doesn’t change the facts that the evening was all kinds of fun and the quality of music making was outstanding. The musicians of the LA Phil never fail to impress, playing capably and sounding excellent despite having to match their tempi and phrasing to whatever was on the screen. As for the dancing and the dancer? It’s the 21st century, so let’s just focus on the fact that prima ballerina Ida Nevasayneva was en pointe for most of the time. Underlying it all was the brilliance of Chuck Jones, Friz Freleng, Carl Stalling, Mel Blanc, and many others, in their ability to merge the silly and the sublime to create truly great art. One cannot underestimate the importance of classics like “What’s Opera, Doc?” (Wagner’s Ring cycle distilled down to 6 minutes) or “The Rabbit of Seville” (Rossini’s music — and a little of Mendelssohn’s too — as soundscape for the ongoing Elmer Fudd vs. Bugs Bunny feud). And you how do you not love that the Hollywood Bowl itself stars in many of the cartoons, including Tom & Jerry’s “The Hollywood Bowl” and my personal favorite, “Long Haired Hare” (featuring Bugs as a dead-ringer for Leopold Stokowski). Yes, I saw the live presentation of 2001: A Space Odyssey four days later. Yes, that concert/film combination was good. Yes, this one was better. Tags: Andrew Bain, Bruce Broughton, Bugs Bunny, Gil Shaham, Gustavo Dudamel, Hollywood Bowl, Mirga Gražinytė-Tyla, Sarah Willis, Stefan Dohr, Timothy Jones. Bookmark the permalink.